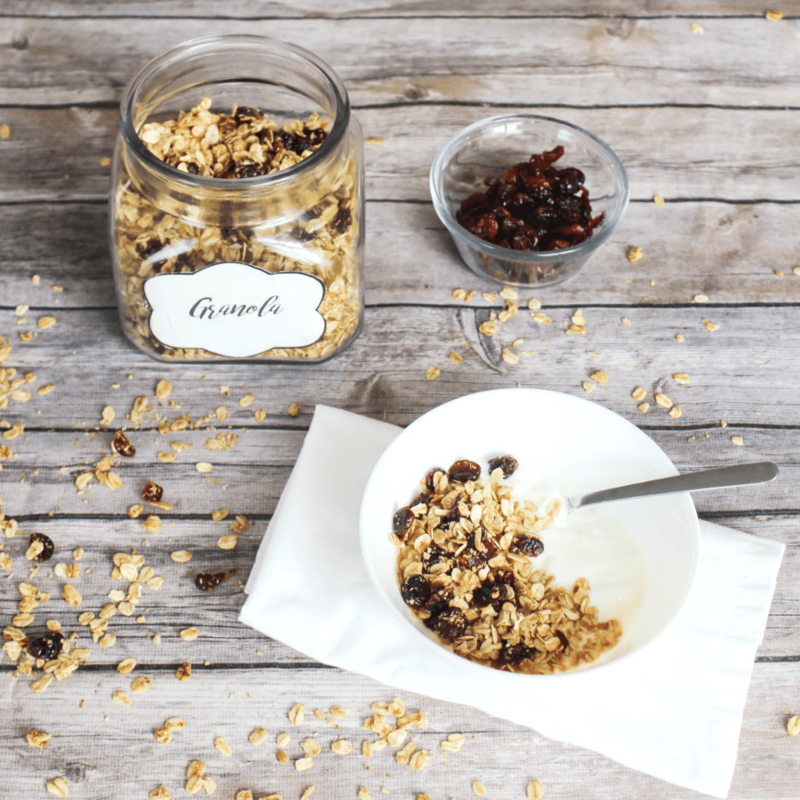 Make your own homemade granola and customize it to suit your family’s taste. You can make it healthy by using wholesome ingredients then storing in an airtight glass jar. Use it to as a topping your family will enjoy. I didn’t grow up eating granola. We ate oatmeal a ton but no granola. In fact, when I first started to eat granola I didn’t like them much. They were a little too hard and crunchy for my taste. That goes went for granola bars too. Until I discovered that there were various different kinds (including the chewy kind) and also the fact that you can make your own. 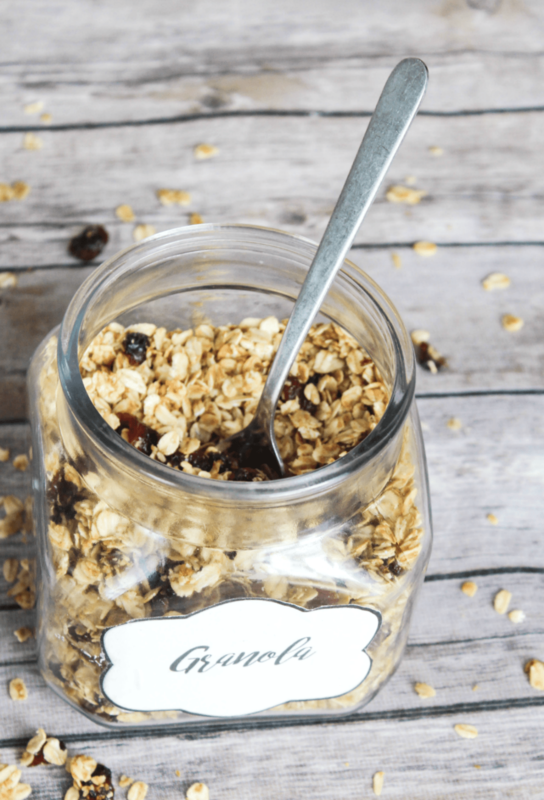 Since then, I’ve been experimenting with ingredients to make our own granola that is both healthy, wholesome, and not too crunchy and hard. It’s just a preference, it’s OK if you like them a little on the crunchier side. 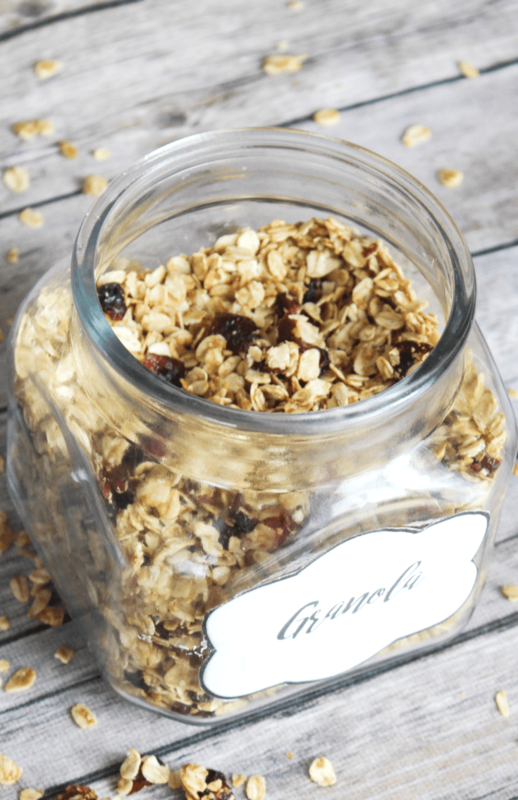 I like to make a batch of granola that I store in glass food jar and use over yogurt or as a snack for the kids. They love it! If you are in a crunch on school or work mornings you can serve this over some yogurt (get the ones with less sugar) and fruit for a quick breakfast for the kids or for yourself. Mix oats, wheat grem and cinnamon in a medium bowl. Set aside. Pour coconut oil in a small pot over very warm heat. Add honey and stir to combine. Stir in vanilla. Combine coconut oil mixture to oat mixture. Stir in cranberries (this could also be done after baking). Spread evenly on prepared pan. Bake for 10 minutes. Stir and bake another 5 – 10 minutes. Remove from oven. Stir in optional add-ins, if desired (raisins could be added before baking, too). 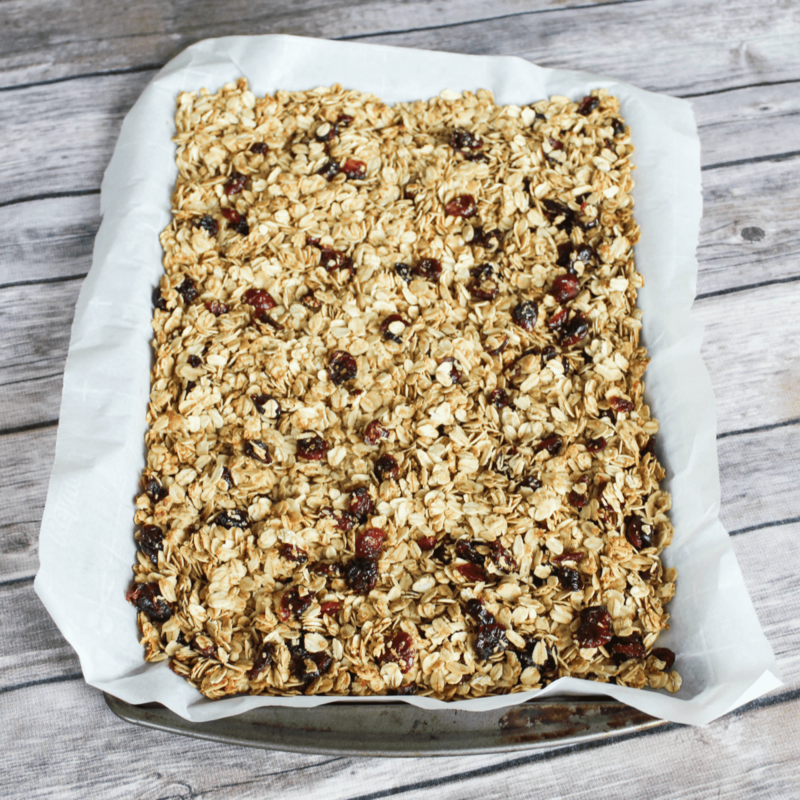 Allow granola to cool in pan. Store in a tightly sealed glass airtight food jar. 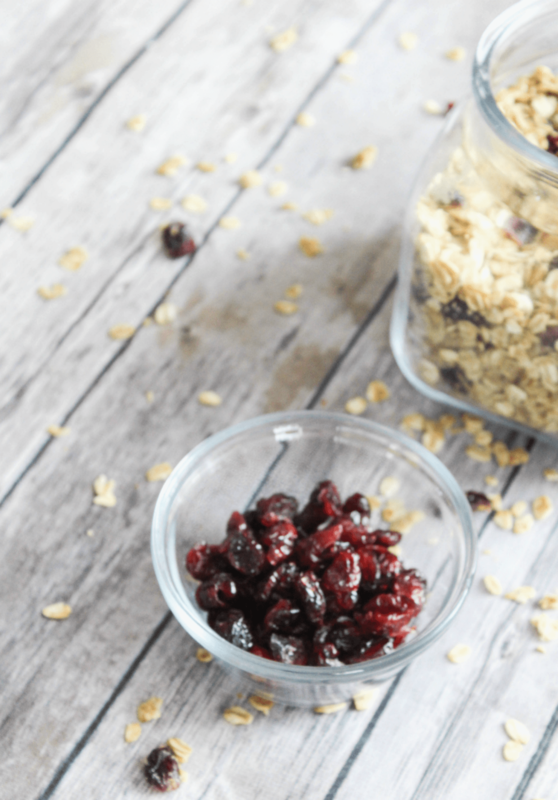 Tips: Both raisins and cranberries could be added before or after baking. For additional flavoring, toast the coconut and nuts about 3 minutes in the oven at 375 degrees. Set aside, then stir into the granola after it is baked. You don’t want to bake them along with the granola or they will get too toasted and burnt. It’s why I toast them separately for a shorter amount of time or skip the toasting all together and use them as they are. Note: I typically separate this batch into two and keep this simple one for the kids but add extra add-ins for the parents. The kids are not into nuts and all the other add-ins yet so we stick to cranberries for now. I love the additional almond slices and unsweetened coconut mixed into mine. 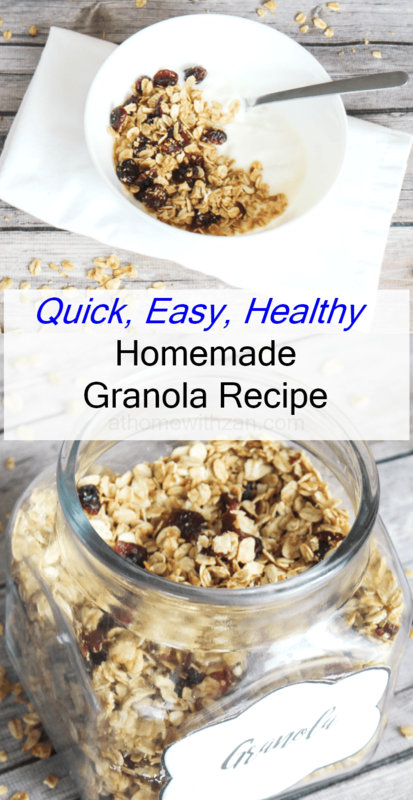 This granola is not very sweet and the grains are quite loose instead of clumped together. I think I it will be fun to experiment with the clumped version to with a texture that we like best. 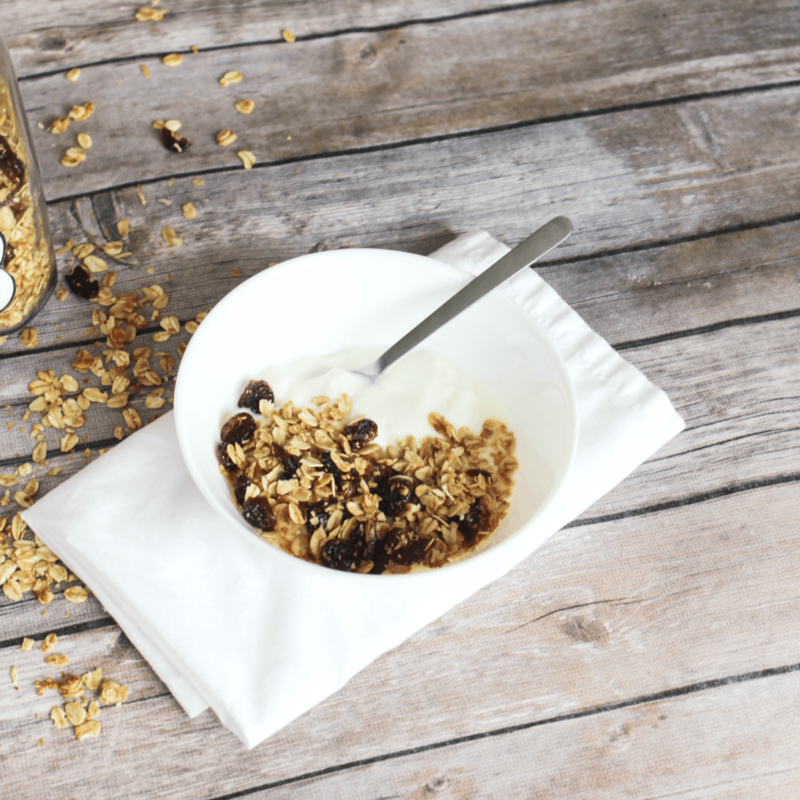 Throw some over yogurt for a breakfast or snack, top over cereal, eat a few spoonfuls for a quick snack or whatever ever way you can find to enjoy it. Do you eat granola? Do you make your own and do you prefer them crunchy or a little less crunchy?